Munenori signed a minor league contract with the Cubs, January 19, 2016, after three seasons in the Blue Jays organization ... has appeared in parts of five major league seasons with Seattle (2012), Toronto (2013-15) and Chicago (2016), batting .237 (150-for-633) in 276 games...Selected in the fourth round of the 1999 Nippon Professional Baseball League amateur draft by the Fukuoka Hawks ... played 11 seasons in Japan and was named an All-Star eight-consecutive seasons from 2004 through his final campaign in 2011...Earned Japan's interleague MVP honors in 2008 after batting .366 vs. the Central League...Earned the Best Nine and Golden Glove awards in four-straight seasons from 2004-07...Won two Japan championships in 2003 and 2011...Member of Japan's gold medal winning World Baseball Classic squad in 2009 ... also was the starting shortstop for the team in 2006...Played for Japan in the 2008 Beijing Olympics... Signed with the Mariners in January of 2012 and made his major league debut April 7 of that season at Oakland...Named Mariners recipient of the MLBPAA 2012 Heart and Hustle Award, presented annually to an active player who demonstrates a passion for the game of baseball and best embodies the values, spirit and tradition of the game. 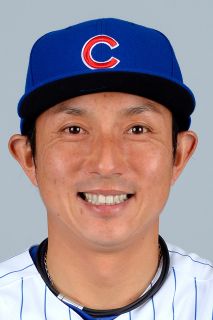 Munenori had three stints with the Cubs, but spent most of the season at Triple-A Iowa ... played in 14 games with Chicago, batting .333 (7-for-21) with two doubles and an RBI ... became the sixth Japanese-born player to appear in a game for the Cubs and the first position player since Kosuke Fukudome...Reached base three times, September 27 at Pittsburgh, going 1-for-3 with two walks and a season-high two runs scored ... went 1-for-2 with a double in the Cubs 1-1 tie at Pittsburgh, September 29 ... collected a pinch-hit, RBI double, September 6 at Milwaukee...In 102 games with Iowa, he swiped 20 bags, his most-ever in a season since coming stateside ... batted .255 (80-for-314)... Went 3-for-5 with a double, RBI, walk and a season-high three runs scored, May 14 at Reno...Hit his first-career minor league homer (second between majors and minors), August 18 at Sacramento.© Had a .982 fielding percentage (seven errors) in 100 games at shortstop for Iowa. Munenori spent the majority of the season at Triple-A Buffalo, batting .245 (48-for-196) in 62 games ... made five stints with the Blue Jays, appearing in 23 games total, including 10 starts between second base and third base...His 23 major league contests were his fewest in a season since signing with the Mariners out of Japan in 2012...With Buffalo, he batted .277 (44-for-159) against righties, but just .108 (4-for-37) against southpaws...Went 3-for-4 with two doubles and a season-high three runs, April 23 at Lehigh Valley...With Toronto, recorded two extra-base hits as he connected on doubles in back-to-back contests, June 7-8...Recorded a perfect 1.000 fielding percentage in 20 major league games in the field, converting all 43 of his chances. Appeared in 82 games across two stints with the Blue Jays, setting career-highs in batting average (.258), OBP (.327), hits (62), doubles (7) and runs scored (31) ... recorded a higher batting average against lefties (.283) than against righties (.253) ... batted .307 in July, a career-high for any month...Posted a .346 average with a .426 OBP in close and late situations...Had a career-high eight-game hitting streak snapped July 21 vs. Boston ... batted .382 over that span with five multi-hit games...Recalled from Buffalo for the second time on June 17 and spent the remainder of the season with Toronto. In first stint with TOR (April 13-July 12), played 70 games recording four triples, four doubles, a home run, seven stolen bases, 20 runs scored and 20 RBI...In his second stint with TOR played 26 games and hit .274 with a .348 OBP and .687 OPS...He reached base safely in 55 of his 90 games this year with an AB...Ranked T-1st on club with 5-3B...On Sept. 25 at BAL, had a career-high four hits, going 4-for-5 with a double...On Sept. 21 at BOS was ejected by 1B umpire Cooper for arguing an out/safe call… It was his 1st career ejection...On June 21 vs. BAL, hit the 1st HR of his MLB career (off Hunter)… Became oldest Blue Jay at age 32 to hit their 1st career HR...May 26 vs. BAL hit a 2R double in the 9th inning to win the game in a walk-off...April 15 vs. CWS hit his 1st career 3B (107th career AB)...April 13 at KC became 1st Japanese-born position player to appear in a game as a Toronto Blue Jay in franchise history…Had his contract selected from Buffalo (AAA) that day. Named Mariners recipient of the MLBPAA 2012 Heart and Hustle Award, presented annually to an active player who demonstrates a passion for the game of baseball and best embody the values, spirit, and tradition of the game...Appeared in 61 games, making 29 starts (SS-25, 2B-4); also made one appearance at third base...Was perfect in 134 total chances in 286.2 defensive innings including 56 putouts, 78 assists and 16 double plays...Career-high 3 RBI on June 4 at LAA, going 2-3 with a double (only XBH of season)... Had a then career-high 3 hits Aug. 7 at Baltimore, going 3-6 with a run scored...Made MLB debut on April 7 at OAK (1-4, RBI) while starting at shortstop. Appeared in 144 games for the Fukuoka Softbank Hawks in the Japan Pacific League ... helped lead Fukuoka to the Japan Series championship ... named a NPB All-Star for the 8th consecutive season ... hit .267 (161x603) with 19 doubles, 7 triples and 37 RBI ... recorded a .981 FLD% (12 E, 617 TC). Recorded career-highs with 190 hits and27 doubles...also tied career-high with 4 home runs. Hit .259 (140x540) with 26 doubles, 8 triples and 4 home runs...stole career-high 44 bases ... member of Japan's gold medal winning World Baseball Classic squad. Hit .366 vs. the Central League to earn InterleagueMVP honors ... appeared in 99 games battling through an injured left foot ... appeared in 3 games for Japan in the Beijing Olympics. Limited to a career-low 95 games ... hit .329 (126x383). Won the Pacific League Best Nine and Golden Glove awards ... received the most fan votes at shortstop for the MLB-NPB All-Star Series held in November ... starting shortstop for Japan in the inaugural World Baseball Classic. Hit .271 (108x399) in 102 games. Tied for Pacific League lead in hits (171) and led the circuit with 42 steals ... earned the Best Nine and Golden Glove awards. Fukuoka's Opening Day shortstop for the first time in his career ... helped lead club to Japan Series championship. Saw action in 36 games at the Major League level ... won the Western League batting title batting .367 ... played for Japan in the IBAF International Cup. Made his debut with Fukuoka at the Major League level on Oct. 3 vs. Orix ... ranked 135 2nd in the Western League (minors) with 29 stolen bases. March 28, 2017 Iowa Cubs released SS Munenori Kawasaki. January 27, 2017 SS Munenori Kawasaki assigned to Iowa Cubs. January 7, 2017 Chicago Cubs signed free agent SS Munenori Kawasaki to a minor league contract and invited him to spring training. November 3, 2016 SS Munenori Kawasaki elected free agency. November 3, 2016 Chicago Cubs activated SS Munenori Kawasaki. October 7, 2016 Chicago Cubs reassigned SS Munenori Kawasaki to the minor leagues. September 6, 2016 Chicago Cubs recalled SS Munenori Kawasaki from Iowa Cubs. July 15, 2016 Chicago Cubs optioned Munenori Kawasaki to Iowa Cubs. July 11, 2016 Chicago Cubs optioned SS Munenori Kawasaki to Iowa Cubs. July 9, 2016 Chicago Cubs recalled Munenori Kawasaki from Iowa Cubs. April 15, 2016 Chicago Cubs optioned 2B Munenori Kawasaki to Iowa Cubs. April 8, 2016 Chicago Cubs recalled Munenori Kawasaki from Iowa Cubs. April 3, 2016 Chicago Cubs selected the contract of 2B Munenori Kawasaki from Iowa Cubs. April 3, 2016 Chicago Cubs optioned 2B Munenori Kawasaki to Iowa Cubs. April 1, 2016 Munenori Kawasaki assigned to Iowa Cubs. March 29, 2016 Chicago Cubs signed free agent SS Munenori Kawasaki to a minor league contract. March 29, 2016 Chicago Cubs released 2B Munenori Kawasaki. January 27, 2016 2B Munenori Kawasaki assigned to Iowa Cubs. January 19, 2016 Chicago Cubs signed free agent 2B Munenori Kawasaki to a minor league contract and invited him to spring training. November 2, 2015 2B Munenori Kawasaki elected free agency. October 24, 2015 Toronto Blue Jays activated 2B Munenori Kawasaki. October 8, 2015 Toronto Blue Jays reassigned 2B Munenori Kawasaki to the minor leagues. September 1, 2015 Toronto Blue Jays recalled 2B Munenori Kawasaki from Buffalo Bisons. August 9, 2015 Toronto Blue Jays optioned 2B Munenori Kawasaki to Buffalo Bisons. August 1, 2015 Toronto Blue Jays recalled Munenori Kawasaki from Buffalo Bisons. June 26, 2015 Toronto Blue Jays optioned 2B Munenori Kawasaki to Buffalo Bisons. June 19, 2015 Toronto Blue Jays recalled Munenori Kawasaki from Buffalo Bisons. June 10, 2015 Toronto Blue Jays optioned 2B Munenori Kawasaki to Buffalo Bisons. May 31, 2015 Toronto Blue Jays recalled Munenori Kawasaki from Buffalo Bisons. May 25, 2015 Toronto Blue Jays optioned 2B Munenori Kawasaki to Buffalo Bisons. May 22, 2015 Toronto Blue Jays selected the contract of Munenori Kawasaki from Buffalo Bisons. May 20, 2015 Buffalo Bisons activated 2B Munenori Kawasaki from the 7-day disabled list. May 12, 2015 Buffalo Bisons placed 2B Munenori Kawasaki on the 7-day disabled list. January 16, 2015 Toronto Blue Jays signed free agent 2B Munenori Kawasaki to a minor league contract and invited him to spring training. January 16, 2015 2B Munenori Kawasaki assigned to Buffalo Bisons. October 31, 2014 2B Munenori Kawasaki elected free agency. October 1, 2014 Toronto Blue Jays sent 2B Munenori Kawasaki outright to Buffalo Bisons. June 17, 2014 Toronto Blue Jays recalled 2B Munenori Kawasaki from Buffalo Bisons. April 19, 2014 Toronto Blue Jays optioned SS Munenori Kawasaki to Buffalo Bisons. April 15, 2014 Toronto Blue Jays selected the contract of Munenori Kawasaki from Buffalo Bisons. March 31, 2014 SS Munenori Kawasaki assigned to Buffalo Bisons. December 24, 2013 Toronto Blue Jays signed free agent SS Munenori Kawasaki to a minor league contract and invited him to spring training. November 1, 2013 SS Munenori Kawasaki elected free agency. August 19, 2013 Toronto Blue Jays activated SS Munenori Kawasaki from the paternity list. August 16, 2013 Toronto Blue Jays placed SS Munenori Kawasaki on the paternity list. August 14, 2013 Toronto Blue Jays recalled SS Munenori Kawasaki from Buffalo Bisons. July 13, 2013 Toronto Blue Jays optioned Munenori Kawasaki to Buffalo Bisons. June 28, 2013 Toronto Blue Jays recalled Munenori Kawasaki from Buffalo Bisons. June 26, 2013 Toronto Blue Jays optioned Munenori Kawasaki to Buffalo Bisons. April 13, 2013 Toronto Blue Jays selected the contract of Munenori Kawasaki from Buffalo Bisons. March 22, 2013 SS Munenori Kawasaki assigned to Toronto Blue Jays. March 18, 2013 Munenori Kawasaki assigned to Buffalo Bisons. March 2, 2013 Toronto Blue Jays signed free agent SS Munenori Kawasaki to a minor league contract. October 24, 2012 Seattle Mariners released SS Munenori Kawasaki. March 26, 2012 Seattle Mariners selected the contract of SS Munenori Kawasaki from Tacoma Rainiers. December 21, 2011 Seattle Mariners signed free agent SS Munenori Kawasaki to a minor league contract and invited him to spring training. December 21, 2011 Munenori Kawasaki assigned to Tacoma Rainiers.